Plants have been teachers and guides to humans for millenia. Deeply woven into our own DNA are receptors for certain plants and plant compounds. Our ancestors understood this, and in different parts of the world, cultivated thousands of medicinal plants, healing plants, teacher plants, for use on mind, body, and spirit. While the physical plant can offer much to our bodies in terms of healing, strengthening, and support (which is the basis of herbalism practice), plant spirits can offer the same thing to our hearts and spirits. While there are lots of ways you might go about doing this, one useful tool is to enage in plant spirit journeys. This is the third post in my plant spirit communication series; if you haven’t yet read the first two posts, go here and here. Journeying is a catch all term that describes “inner” experiences that people have where they go to new places, meet spirits and guides and other beings, and interact in various ways. Depending on the tradition, worldview, and belief systems of the practitioner, these journeys be described as taking place in the realm of the imagination or on alternative planes or dimensions that are as real as the material plane we inhabit. While what you believe about the experience is important, especially to your own processing of it, it doesn’t actually change the fact that, with practice, anyone can do spirit journeys regardless of what they believe–as long as they are open to the experience. The act of journeying is ancient, from accounts and records of indigenous peoples all over the world and the myths and legends worldwide, this practice was a common practice, a human pratice, a tradition of many ancestors in many places. Sometimes, and in some cultures and traditions, journeys are supported with the use of teacher plants or mushrooms to put people in a more receptive state; other times, they are supported with chanting, drumming, or other ways of achieving a deep meditative state. Today’s post explores the idea of inner journeying for the purpose of connecting with plant and tree spirits. What I’m offering here are some of my own techniques that I’ve adapted and developed for specific use with plant spirit work; these techniques are heavily informed by both my studies in the druid tradition as well as my experiences studying the Celtic Golden Dawn. Just as we experience on the physical plane, journeys have power. In our everyday lives, journeying to new places and experiencing new things helps us grow tremendously. A journey offers us a chance to step away from our everyday rhythms and life, to see new things, eat new foods, meet new people, gain new insights, and go new places–all of which helps us process old wounds and grow as people. Journeys can offer our physical bodies and minds relaxation and rejuvenation. Everything that I just wrote about “outer” journeys an also be true of “inner” journeys, including plant spirit work. In both cases, the journey helps us experience new things and do deep work on ourselves, our healing, and our own spiritual and mental development. And in the case of journeying with/to plant spirits, the plants have much to offer us in terms of teachings, healing, and insight. Plant spirit journeys do require a few kinds of preparation. Preparation helps ensure a good and productive plant spirit journey. Preparation of the mind. Building your own skill in meditation and focus can greatly aid you in your plant spirit journeys. I shared some of the fundamentals with regards to getting ready to do deep work with plants in my earlier post, particularly concerning meditation. I suggest if you haven’t read those two posts, please review them. Before you do a plant spirit journey, it is also helpful to check your mental state: if you are in a place of high emotions (anxiety, anger, elation, etc) you may not be in a balanced place to have a good journey and your own emotions may cloud or otherwise disrupt the journey. I would suggest choosing a different time for plant spirit work where you are calm and in a good mental head space. One of the skills needed for inner journeying is visualization. In conjunction with meditation, it also can be a skill that takes time to establish. If you haven’t done exercises in visualization before, here is one to get you started. Begin with the candle meditation (described in my earlier post). Focus your eyes on the candle as it flickers and continue your breathwork. Have the image of the candle firmly in your vision. Now, close your eyes; continue to see that candle in your inner vision. Practice this, and eventually, you can attempt to visualize other things: forests, stone circles, anything you like, to practice in preparation for your journey. Preparation of the body. Preparing yourself physically can also help you get into a receptive state of mind for the journey to take place. There are a lot of options here, and you should choose what most appeals to you. I like to do a bath in candlelight, and then don simple yet comfortable cotton robes to do my plant spirit journey work. If you don’t have time for the bath, you might do a simple smudge technique. Again, what this is doing is helping you prepare, washing or smudging away some of the worries of the day, and so forth. Preparation of the space. Physically preparing the space where you will do your plant spirit journey is also helpful. If you are outdoors, you might have to find the “right spot” and then perhaps setup a small altar for the elements. If it is during anytime where bugs would bother you (and oh my goodness, can mosquitoes ruin a good journey) I would suggest finding a way to keep them off of you. I actually use my backpack tent; it has a fully screened inner area (and an outer rainfly). If I set it up (which takes all of 5 min), I can then go into the tent, still be outside, and not let the bugs bother you. This isn’t always necessary, but in areas where there are dominant horse flies and mosquitoes (pretty much anywhere I’ve lived from July to September) it is a wonderful way to maintain your focus and still be out in the world. If you are indoors, again, setting up a small altar or lighting the space with candlelight can be useful. I have my main altar in my art studio; under the altar is a thick carpet that is perfect for laying down and doing journeying work. I will tend the altar (setting up the elemental bowls, getting incense lit, lighting candles, etc) before I begin. If I have a specific plant I want to meet, I will use a piece of the plant (physically) or image of the plant and place it on the center of the altar. Prepare others in your life. Minimizing distractions is a really important part of inner journeying. You don’t want to have your partner or child disrupting your journey work–it can be extremely disorienting (and rude to the plant spirit). So make sure you are able to find quiet for this work–that might mean doing it late at night or early in the morning before others you live with are awake, etc. It also means tending to any pets that may be disruptive (not all are, my cat, Grimalkin, will often join me in my ritual space and serve as a gaurdian). The point here is to give yourself a quiet, safe space for this work–and give yourself a span of whatever time you need. Offerings to ancestors, spirits of the land, plant spirits, etc. Casting a circle or establishing a sphere of protection around the space. At the end of the journeying, you take the sacred space down: thanking the elemental powers in the four directions, perhaps saying another prayer or two, perhaps making another offering, unwinding the circle/sphere of protection, and declaring the ceremony over. It is important to establish your sacred space each time you sit down to do journeying. Establishing a sacred space helps put you in the right frame of mind; it also assures that any unwanted influences, spirits, and so on, are kept from the space for the duration of your plant spirit journey. Many traditions that use journeying, including both the Celtic Golden Dawn and OBOD Druidry, use an inner grove, or series of inner groves, to help you establish a safe space for journeying work. Establishing a safe space on the inner planes is critical for long-term plant spirit work, and can put you in a place of comfort from the very beginning. Your Sacred Grove. The first stage of plant spirit journeying should be in establishing and exploring a space that you find or designate as your inner grove. Your inner grove is a space that your visualize and travel to that is your starting point. To begin to establish a sacred grove, you might think about an outdoor place that you really love or envision an outdoor place that you’d love to be in. This space should be completely peaceful and safe for you. What features of this space do you want to include? A stone circle? A ring of trees under the moonlight? A beach with the waves lapping against the shore? Once you have decided upon a space that suits your needs. Start by visualizing these features in your inner eye. Work to establish this image as firmly as possible; the first time you go in. If you are new to journeying work, it may take some time–and that’s ok. There is no rush, and these practices take the time they take. (As a reference, when I started this kind of work in my adult life, it took me several months of regularly journeying work to get to a place where I felt comfortable in and around the sacred grove). 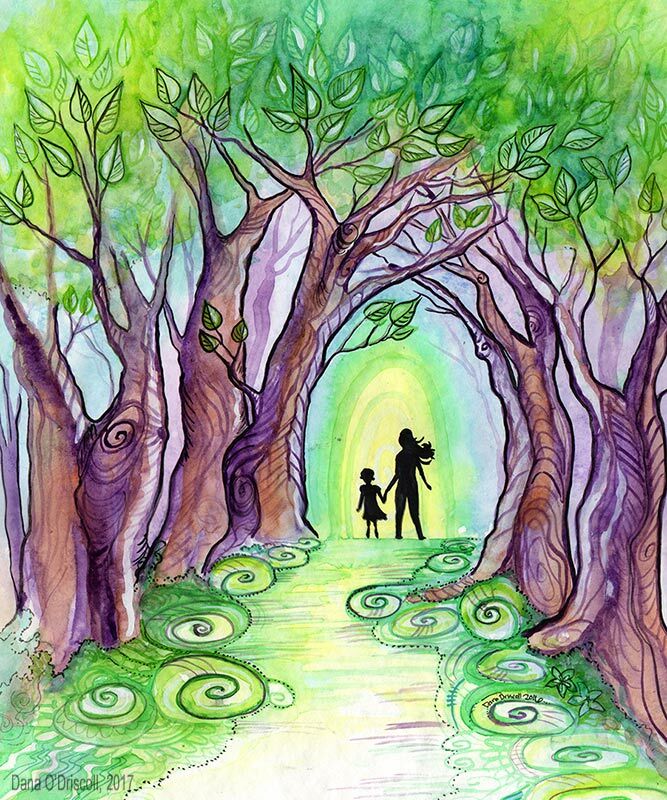 You might also find that it is helpful to create a “key” to enter your sacred grove. A tune of music, a particular drumbeat, a specific word or chant–something that helps put you in a receptive space to enter that inner grove can be very helpful. Train yourself to your key by using it just before you aim to enter the inner grove. Once you have the grove established, you might do some exploration–what is where in your sacred grove? Do you see paths, gateways, and so on? is there an altar? Objects on the altar? What is growing? Is there anyone in your sacred grove? (You might already have spirit guides, plant spirits, and other guardians in that space to interact with). You will likely find that a whole landscape begins to grow as you do this work. The more you put into visiting and exploring the sacred grove, the more rich experiences you will have. If you are preparing to meet a particular plant spirit, it is very helpful in the day(s) before you do that journey, you have interaction with the plant on the physical plane if at all possible. Interaction can mean a lot of things: planting seeds or harvesting part of the plant, sitting with the plant in meditation or observation, drinking a tea or eating some of the plant, smoking some of the plant, making things from the plant, working wood from the tree, you get the idea. Use the plant, interact with it, and if at all possible–bring it into your body in some way (if it is safe to do so). This “primes” you for the spirit connection. You can do this priming for days or even weeks in advance. For example, put rosemary in your food, create a rosemary smudge stick, sit with your potted rosemary and tend her, drink a rosemary tea–and when you go to do your plant spirit journey, you are likely to have gotten Rosemary’s attention. The plants, particularly the healing plants, want to work with us, but we have to show them that we want to work with them too. For example, I primed myself for meeting tobacco on the inner planes by harvesting it at Lughnasadh in a ritual, laying it out for drying, and also writing about it on my blog. When I went to do another plant spirit journey as part of developing my Plant Spirit Oracle, it was unsurprising that Tobacco showed up with his wisdom and offered me a painting for the deck! Going on a journey–where will it lead? You’ve prepared your mind, body, and spirit for the work. You’ve established a safe inner grove that you can begin with–now the time comes for the plant spirit journey itself–which has several steps. Prepare your mind, body, and space. Open up your sacred space. Make an offering: Begin your plant spirit journey ceremony by making some kind of offering to the plant. Offerings can be many things: compost, music, liquid gold, cornmeal, tobacco, even a bit of special rainwater you collected, etc. Let the plant spirit know that you are calling to them and honor them–get their attention. Prime yourself. As you begin your inner journey work, you may find it helpful to prime yourself with the plant–drink a tea, use an oracle card or image to focus on the plant or a piece of the plant or the potted plant. Have it with you physically in some way as you enter your inner grove. The Journey. Make yourself completely comfortable (sitting, laying) so that you can stay still for an extended period of time. Enter your inner grove. Call out to the plant spirit and ask them to guide you. Wait for the spirit to arrive (helpful plants, like herbs, are almost certain to come! Other spirits may take more work and multiple calls, especially those who are less connected with humans). Let the spirit guide you on the journey. Journal. Keep a journal about your experience; I suggest writing in your journal prior to even closing out the space. I literally keep my journal next to me as I do my journey, and as soon as I come back to my physical body, I write everything down. If you wait too long, your mind will no longer be in the state it was during your journey, and you may lose details (and the details are important!) So get it all down so you can reflect on it later. Close out the space. Thank the spirits and powers you summoned, bring yourself back to this plane. Do some grounding. Ground yourself after the experience–eat something, allow yourself time to re-integrate back into your life. Meditate on your experience. Spend some time reflecting and meditating about the experience in the week or so after your journey. You will often find that you can have additional and deeper insights if you meditate on portions of the journey each day in the days after the journey. This meditation process can take some time. For some journeys, it can take weeks of reflection to “unpack” everything that is present in the journey! 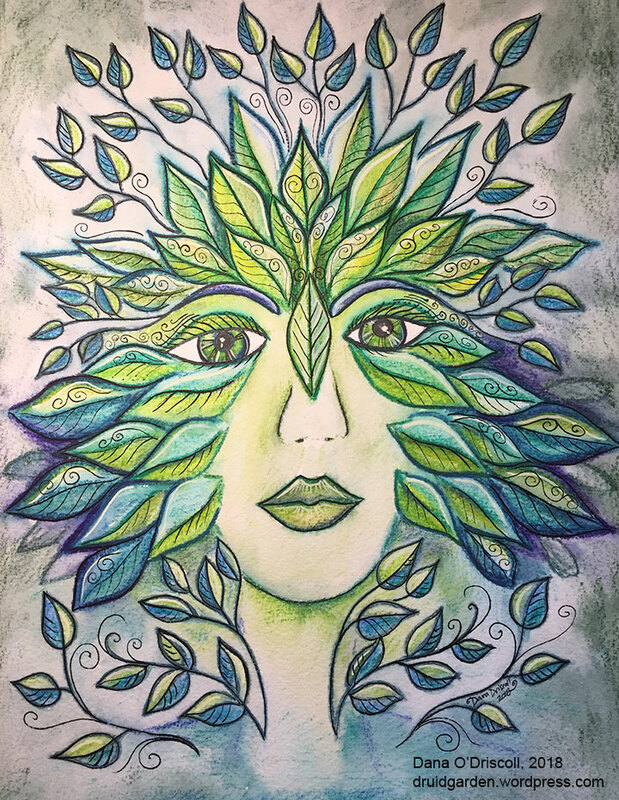 Plant spirit journeys are amazing ways to connect deeply with yourself and the plant kingdom and it can be a regular part of your spiritual practice offering deep awareness, insight, and joy. I wish you blessings on your travels!